NPR's Underwriting Guidelines, Part Two : NPR Public Editor Concerned listeners question the practice of taking underwriting credits from America's Natural Gas Alliance. 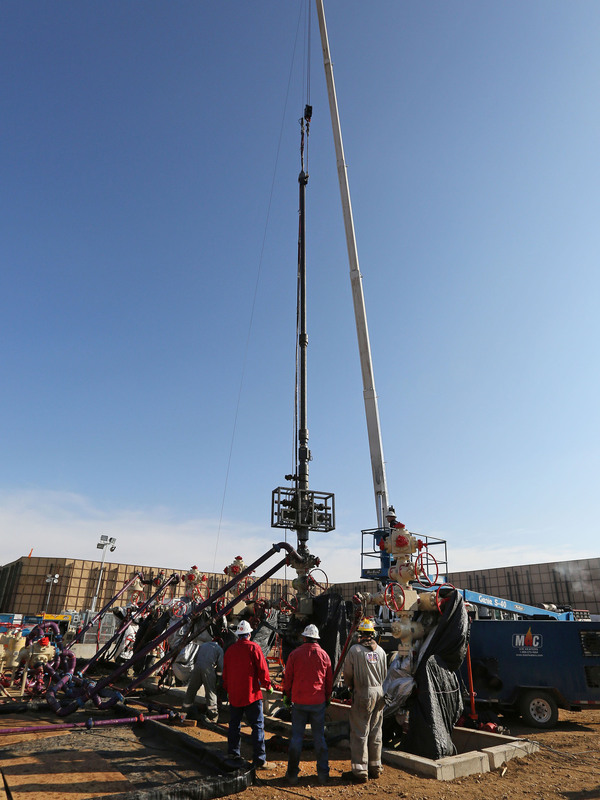 In this March 2014 photo, perforating tools, used to create fractures in rock, are lowered into one of six wells during a roughly two-week hydraulic fracturing operation near Mead, Colo. Here's a typical credit: "America's Natural Gas. Learn how combining solar and natural gas at a Florida power plant makes it possible to generate electricity 24 hours a day, seven days a week, even when the sun isn't shining. ThinkAboutIt.org." The credits appear both on air and on NPR's website. ANGA sponsorship concerns are not new; see previous ombudsman takes on the issue in 2011 and 2009. Many of those who are writing now object to the benign language of the credits, which, not surprisingly, does not acknowledge the negative effects of hydraulic fracturing ("fracking"), a highly controversial method of drilling for natural gas. Christina Molinari of New York, N.Y., wrote: "The ethics and the values of the two organizations just don't jive," referring to NPR and the gas industry. Doug Roysdon of Bethlehem, Pa., said the spots are essentially NPR's "endorsement of the tragic environmental destruction now taking place." Other listeners, including Rich Thompson-Tucker, of Dorset, Vt., worry about how the underwriting affects NPR's reporting. He wrote my office recently: "It is a highly controversial issue and I think there is a real conflict of interest when you accept money from the fracking industry, and are attempting to report objectively on this at the same time." "I think there is a real conflict of interest when you accept money from the fracking industry, and are attempting to report objectively on this at the same time." First an explanation: Most listeners, myself included, hear the sponsorship credits as ads, and many sponsors treat them as such, timing their support to, say, an upcoming movie launch, as in the case of the teddy bear. NPR itself has long touted what it calls the "halo effect" which leaves listeners with a more positive view of companies that sponsor NPR. But legally, the credits are not ads, but represent an acknowledgment by NPR of those who support it. As NPR's underwriting guidelines state, funders "deserve credit for their support of public radio." By being open to all funding sources—and therefore by not being dependent on any one source or group of sources—NPR believes it can better maintain its independence, said Greg Lewis, NPR's deputy general counsel. And indeed, in addition to the natural gas sponsorships, NPR has recently aired an underwriting credit from "Margot and John Ernst, supporting North Country Public Radio in Canton, New York and NPR's environmental coverage which helps to raise awareness on issues surrounding climate change." The Diane Rehm Show aired a credit from "Vicki and Roger Sant, and Island Press, which offers solutions to environmental problems — in print, in person, and online at Island Press.org" and other another from "The Grantham Foundation for the Protection of the Environment, supporting strategic communications and collaboration to address the world's pressing environmental problems. More information is available at Grantham Foundation.org." Moffett, of National Public Media, did say, as an aside, that while NPR has an open access policy, it does not always accept the language sponsors would like to use in their credits. "We tell sponsors 'no' far more than we tell sponsors 'yes,'" Moffett told me. "We've lost lots of money from people who walk away." By being open to all funding sources...NPR believes it can better maintain its independence. Why do NPR sponsorships come in for so much criticism? For one, listeners cannot avoid hearing sponsorships on the radio in the same way they can avoid looking at ads in a printed newspaper or magazine — or zap through TV ads on the DVR. And the amount of NPR underwriting continues to go up; last fall, the amount of time devoted to credits in Morning Edition and All Things Considered jumped by 30 seconds, to a total of 2 minutes and 20 seconds per hour. (The number of sponsors stayed the same but the length of the credits grew.) That figure doesn't include additional time that member stations devote to local sponsorships. The amount of underwriting is going up because the dues and fees paid by member stations (which are in turn partly funded by listener contributions), do not provide enough financial support to enable NPR to do its job. Corporate sponsorships made up 22 percent of NPR's unrestricted operating revenues on average over the three-year period covering the 2012 to 2014 fiscal years. I believe that firewall works and I am confident that NPR's reporters simply aren't paying attention to who is paying the bills when they set about to report a story or cover a beat. Nor are editors directing coverage based on the underwriting they might hear. If they were, stories like this one probably would not have gotten on the air. While the morality of accepting fossil fuel funding will no doubt continue to be battled out in coming years, from the journalism point of view I can't argue with NPR's access policy.